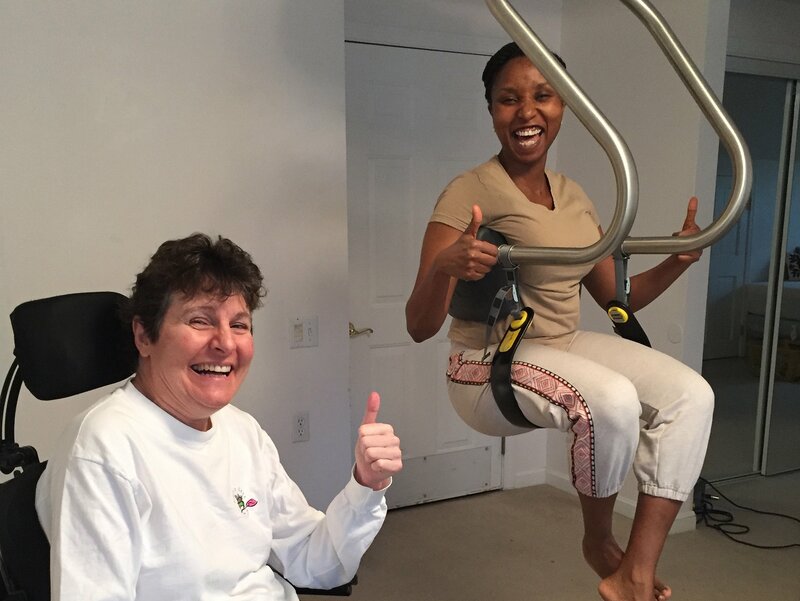 Our dear sister, Gigi, has managed with primary progressive MS since her early 20s—adjusting to life in a wheelchair and to steadily declining abilities while still working, telling stories, and making everyone laugh. Over time, Gigi has needed in-home health care a little bit more each year. On Easter weekend she had emergency surgery and currently needs 24/7 care to do the most basic things. She has nurses and therapists assisting her on a regular basis. Her doctors expect her to recover but it will take time and a whole lot of medical help. Thankfully, Gigi has health insurance, but many of her medical needs are not covered and she has significant out-of-pocket expenses. The fees for home health care alone are prohibitively expensive. Gigi also needs specialized equipment, including a new bed and shower wheelchair. These costs are too high for Gigi to handle alone. To help with the financial burden of Gigi’s uninsured expenses, a fundraising campaign in her honor has been established with HelpHOPELive, a trusted nonprofit organization that has been providing community-based fundraising guidance to patients and their families for more than 30 years. All donations are tax deductible, are held by HelpHOPELive in the Northeast Catastrophic Illness Fund, and are administered by HelpHOPELive for illness-related expenses only. Please consider a making a contribution today and click the DONATE NOW button. Everyone is getting in on the fun! The Sure Hands Lift is a true game changer to Gigi’s safety and comfort. Thank you to all you generous friends and family! We are just installing a specialized lift with ceiling track so that Gigi can move from bed to bathroom to wheelchair. The forklift was just too cumbersome! Thank you all for helping us give Gigi mobility!! Gigi is now at fighting weight and is working on returning part time to her job at the Department of Conservation and Recreation. She is currently helping to organize their annual Universal Access Fair. Gigi has gained weight! Up from the mid-90’s to over 105 lbs! Dear Gigi, We send our love, prayers and embrace to you! So happy to hear of your amazing tenacity and abundant positive attitude. Hi Gigi - Wishing you and your family a Happy New Year!!! Best wishes for continued healing and improvement!! It is great to see you have so much love and support! Eat, and keep breathing. .. Merry Christmas. . I asked Nancy what she wanted for Christmas and she said "a banana rack." I'm like, a banana rack? That's it? She says yeah, a banana rack. So I'm spending my money on you instead. Merry Christmas to all the Ranno women! Gigi, my cousin, you are so awesome that we need to find a new word for awesome. Sending tons of love. Who loves Gigi? We do we do. Hey Gigi, We are thinking of you and praying for a speedy recovery. We miss you and look forward to catching up soon! Hi Gigi ~ We know all about needing home care assistance and medical equipment so we are very happy to help! Prayers for a full recovery. Stay strong! God Bless you! Dear Gigi, I am thinking about you and am inspired by your spirit --via Nancy. Keep getting stronger. Dear Gigi, I am praying for you to make a full recovery and leave those really long voicemails on my phone, as only you do. Don't let Louise be the boss of you! Don't tell her I said that. You are surrounded by love and it will heal you. Remember in God all things are possible. Ranno sister's are the best-est! Gigi and Karen, Thank you for good memories of hanging out at your house with Aunt Nancy in Boston. Gigi, you were the first person to introduce me to "the kong" and give me tips on all the trouble I could get into in Harvard square ;) Karen, I really appreciated your career advice as I was wrapping up my PhD and figuring out next steps. Sending love and good wishes to you both! GiGi-so sorry to hear of your surgery and challenges you face. Stay strong! I know you'll get through this difficult time with your family and friends by you :). Sending you lots of love! Geeeeeeeeeg! Keep getting stronger and better each day! You are our inspiration! We love you lots! Thinking of you, Gigi, and sending lots of love. Love that photo! Gigi, What an incredible smile and expression of triumph in your photo! Keep that spirit and smile in your heart always. Gigi - you are in our prayers - Sending love and healing your way! Gigi, we are thinking of you and hope you feel much better soon. Sending lots of "get well soon" love from Colorado! !